The Galactic Civil War comes to Belderone. Aboard a Star Destroyer, Darth Vader discusses his plan for the subjugation of the Belderone system with a group of Imperial officers. On Belderone, Flint enthusiastically urges his friend Barney to come with him to see a landing Rebel ship, but Flint's mother warns him not to be late for his mandated shift in the Imperial factory. They spot Luke, Leia & Lando departing the Millennium Falcon, and when Flint sees Luke's lightsaber, he asks Luke if his father was a Jedi like Flint's. Luke lies, but Flint agrees to take the group into the city, bringing them to his mother's tavern. There, they are recognized, and the local Imperial general sends a trio of assassins to kill the rebels. However, the rebels fight them off, thanks in part to Luke's skills, which convinces Flint he is a Jedi. As Luke & Chewbacca return to the Rebel base on nearby Kulthis to warn them of the Imperial presence on Belderone, Flint & Barney take Lando & Leia to the Imperial factory to show them what the Empire is building. When Vader learns of the failed assassination, he kills the general responsible, then launches an assault on Kulthis. On Belderone, a force of Imperial walkers emerge from the factory, heading towards Flint's town to rendezvous with cruisers en route to Kulthis. He & Barney race back to warn the townspeople, but Flint crashes his landspeeder, knocking them both unconscious. With the help of a Rebel force from Kulthis, as well as Leia & Lando, who commandeer a walker, the factory as well as all the walkers are destroyed, but not before the nearby town is destroyed. When Flint awakens, he believes Barney to be dead, and finds his mother's lifeless body amongst the wreckage of the town. 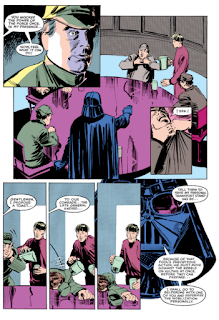 Just then, Vader appears, and offers to make Flint something more, giving him the training to get his revenge. Meanwhile, the Rebels have found Barney & helped patch them up, and he decides to join them, saying he knows the destruction of the town & his family isn't their fault. Later, Flint, now wearing Stormtrooper armor, gives a picture of his mother one last look, then dons his helmet & boards a crusier, under the approving eye of Darth Vader. This the series third and final annual, though it will run for another three years before being cancelled (this series had always been spotty in terms of annuals, given that it's been published for six years and this is only its third annual). 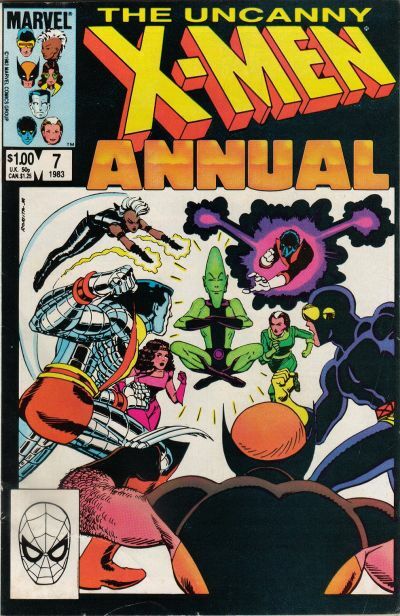 The cover is laid out in a manner consistent with the rest of the 1983 annuals from Marvel (they all had their logos set against a black field with the main image in a box beneath the logo). The planet Belderone, first seen in this issue, lived on in the later Expanded Universe, being mentioned in a handful of novels (it was conquered by the Yuuzhan Vong during the New Jedi Order series) and featured in the Clone Wars-era book Labyrinth of Evil. It was also mentioned in the canonical Tarkin novel, making it part of the current canon (even while this particular story is not). Flint's Jedi father was later said to be a Jedi who helped defend the planet during the Clone Wars, during which time he had a secret relationship which led to the birth of Flint. Upon discovering his deceased mother, Flint gets angry and vows revenge, which is overheard by Vader, who promises to train him in the ways of the Force. Of course, retroactively, we know that the death of Vader’s mother also played an integral role in his fall to the Dark Side. Though both Flint & Barney are setup for future appearances by the end of the issue, with the two friends now on either side of the Rebel/Imperial conflict, neither appears again. Some locals throw shade at Leia for her perceived haughtiness, telling a young girl if she acts like that when she grows up, no man will want her. Flint asks Luke where he got his lightsaber, and you think he’d have a smoother answer to that question by now. 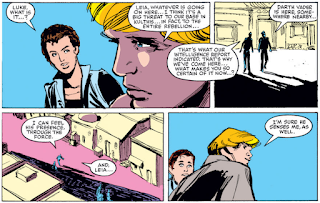 Luke & Vader can sense each other’s presence while both are in the Belderone system, something later echoed in Return of the Jedi (which, of course, takes place after this story, but was already in theaters, so it is also being echoed here). Vader chokes out an Imperial General using the Force, something we haven’t seen him do in awhile. 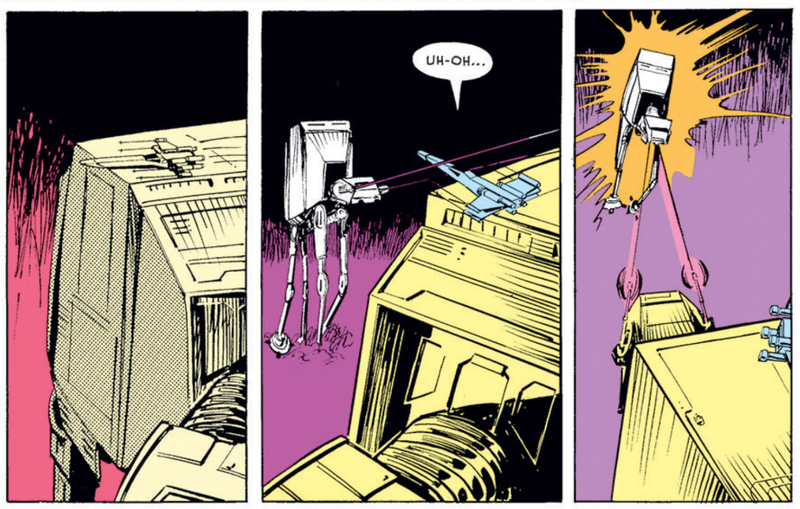 The AT-ATs in this issue are depicted as much larger than in Empire, with an X-Wing capable of landing on top of one with room to spare. For whatever reason, Barney seems like an odd name for a Star Wars character. All in all, this is story works really well as an annual, telling a self-contained Rebel effort to free an Imperial-enslaved planet told from the perspective of the planetary locals. That perspective sidesteps the need to setup the mission within the larger context of the series, and allows for some interesting parallels & contrasts, as Luke comes face-to-face with his past self in the form of Flint, and the impact of the war is depicted via the different fates (and choices) made by Flint & Barney after both experience similar tragedies. Vader is a little out of character - it's odd to seem him sulking in shadows on the ground, waiting for the right time to make his move (and I have no idea what the deal is with the toady running around wiping up after him throughout the issue), but otherwise, from a writing perspective, this is a really solid issue. Unfortunately, the story is let down by the art. 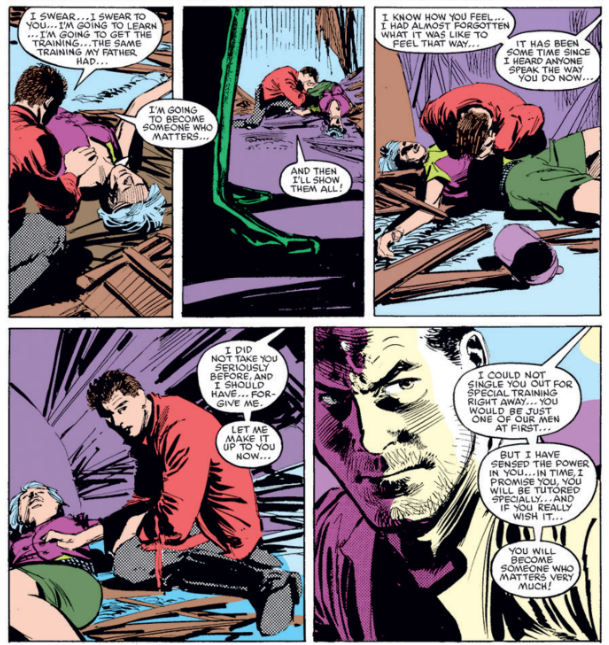 Klaus Janson has done plenty of strong work as both a penciler and an inker through the years, but his work here is particularly rough, crossing the line from "atmospheric" to "messy & incomprehensible" with far too much ease & regularity. Some of the logistical issues (like the over-large AT-AT walkers) can be chalked up to the state of the neo Expanded Universe, but far too often, the artwork fails its basic responsibility of telling a coherent story (the regular Frenz/Palmer team may not be the most dynamic or exciting, but it's always clear about what's going on; here, it's often difficult to tell where in relative space events are happening, characters are standing, etc.). 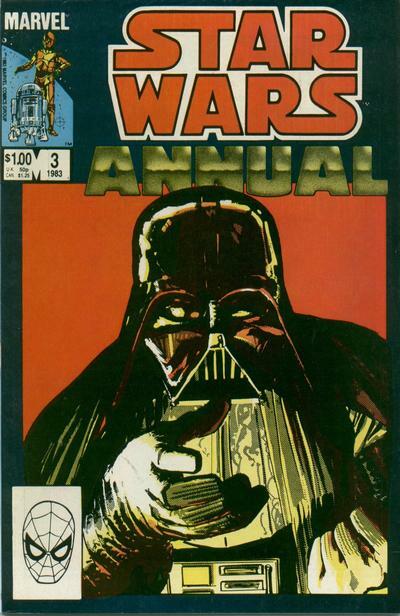 Unfortunately, the messy, inconsistent art drags down an otherwise strong and engaging story that would have stood as the best of the Star Wars annuals. As it is, this feels like a huge missed opportunity to be something great. 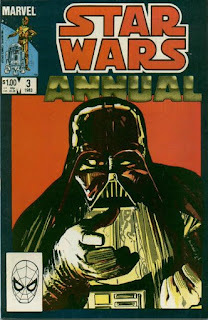 Return to Return of the Jedi with issue #3 of the movie adaptation. I’m no fan of The Phantom Menace, but this scene and Vader’s offer to Flint — already the strongest page of the issue — resonate very effectively in a way Duffy obviously couldn’t have known they would with Anakin’s orphanage in that film. Darth Vader disguises himself with a hat. I’m right there with you on “Barney”. Janson’s art, too. I can appreciate fluidity and looseness as a style, but too often this is just sloppy. Darth Vader disguises himself... with a hat. SMH at our heroes giving out their real names and Luke wearing his lightsaber in the open. I’m not sure what a lightsaber should do to tempered glass or plastisteel or whatever the AT-AT’s windshield is made of, but shattering it into shards doesn’t seem right. Darth. Vader. disguises. himself. with. a. hat. Just found this blog and am enjoying going through it. Flint and Barney do appear again, in #92 "The Dream". Miles & Austin X-Plain the X-Men!